Good Wednesday to you all! Hope your week has started off with a bang! Mine started Monday with a couple bangs, literally. I wiped out in the mud while taking down the last of the Sweet Clover signs for the past weekend’s sale; and then a half hour later I dropped my phone onto the cement and shattered the screen! Bang bang! I am excited to share this dresser with you today. It’s one of those plain jane but solid maple dressers that was ever so popular in the ’70’s. It is a BEAST. With the temperatures hovering around freezing lately and all of the snow, Chris and I lugged it to the basement so I could work on it. We had to remove all of the drawers and carry them separately, which we usually don’t do. (And as you can see, we lugged its beast of a match down as well.) Because I worked on it inside, I didn’t want to sand it, and I knew I wanted to keep the top wood. I had a nice finish already, and there was no need to mess with it! I also knew I wanted to change out the hardware. Before I even saw about 4 blog posts last week claiming that the new trend is copper, I had ordered copper hardware for this piece. Usually when I am on trend it’s sort of a surprise. 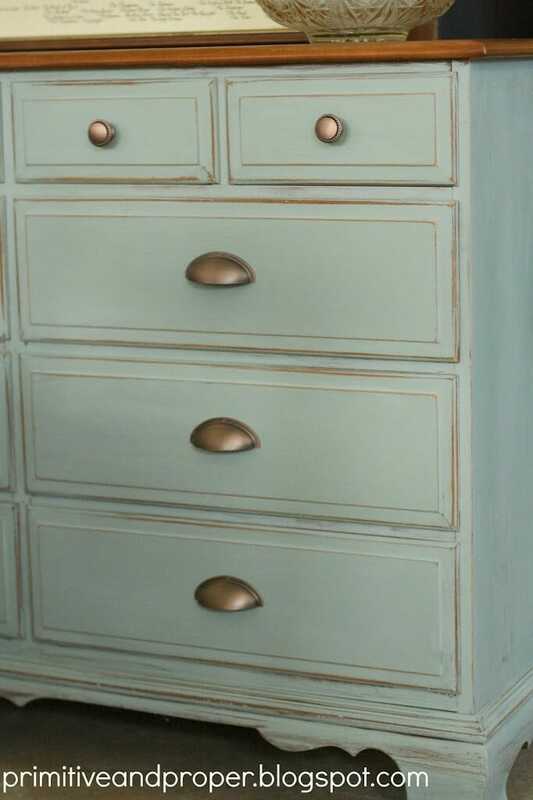 I had chosen the copper hardware for its warmth and complement to the top and duck egg color. I was lucky enough to find copper cup pulls and knobs from D. Lawless Hardware that would fit the existing holes from the original hardware. And I was also lucky enough to have D. Lawless provide me with the hardware for this makeover. And these knobs to go with them…. I got to work removing all existing hardware, and then applied a coat of Annie Sloan Duck Egg, provided to me by Catfish Studios. I love using this color because it gives a nice solid coat each time…. I was able to get way with one coat on this dresser. I used fine sandpaper to distress all of the edges, and then went over it all with a clear wax, which I ten buffed to the sheen I desired. Because it was heavy and in my basement, I had to wait to haul it over to Sweet Clover to get some photos. So here it is staged for you at the barn! I admit that this is not my favorite style of dresser, but Ido love how the edges of the drawers distress so nicely, giving it some depth. And just check out how that copper bounces off the duck egg! It has a very modern country look to it and would work well as a dresser, changing table, or a sideboard. 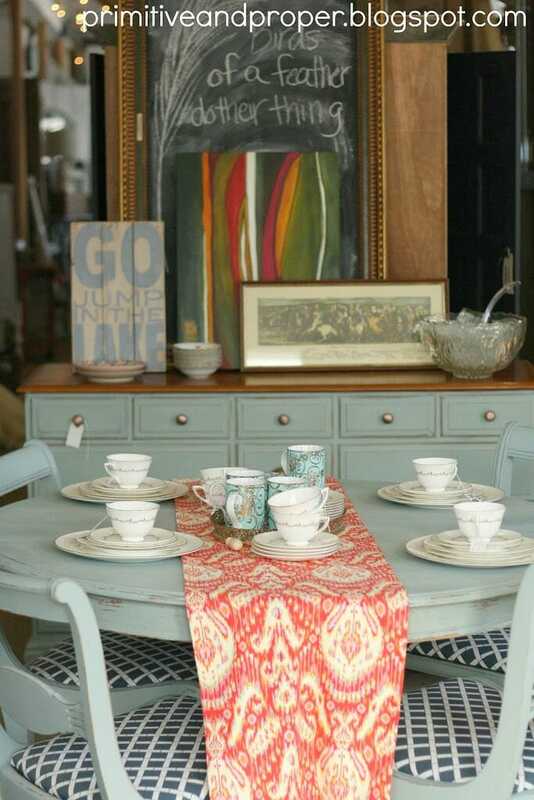 We paired it with this table and chair set I painted a while back and staged it as a sideboard. I am happy to report the table and chairs found their new home, but the dresser is still waiting for its perfect mate! I am sure it will find a home at our March sale! Oh, I’m sure it will find a home! It’s gorgeous. Love the combo. The dresser is so pretty and the photos look amazing! Such a pretty colour. Changing out the hardware really makes a big difference. Lovely! Gorgeous!! Those copper pulls are like jewelry on it! You really made it beautiful, Cassie. Such a great color mix with the warm and cool colors, tied together with the hardware. Well done, as always! I love this color! I didn’t know copper was so big right now, but I love the knobs you picked. I hope you’re having a better week! All those drawers!!! Perfect as a sideboard. The copper hardware looks awesome! Love your update. You totally transformed it into something current and the hardware is fab. I have worked on dressers like that before and they are so heavy it is unbelievable! It looks awesome and I’m sure it will get snatched up! I love the color! 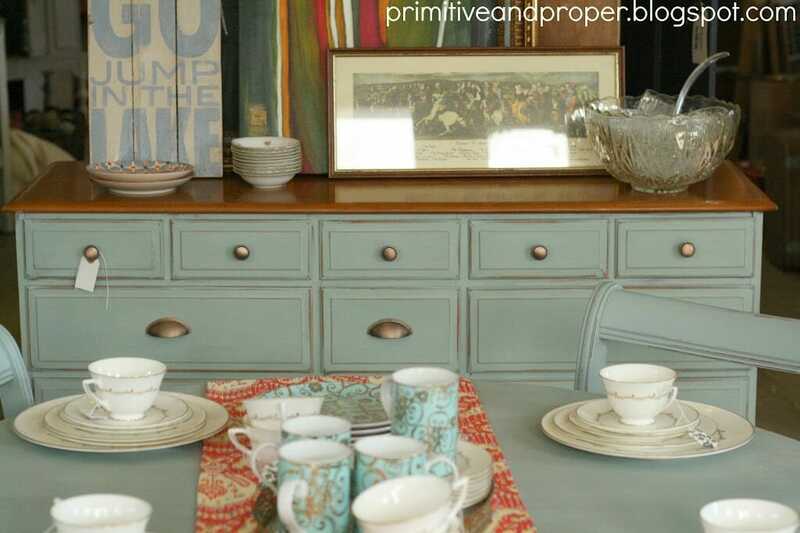 even though sky/duck egg blue is my absolute least favourite colour, you did a bang up job on that dresser. [see what i did there with the bang lol] the copper pulls work perfectly with the colour and the staging in this shot is great. have a smashing [better than bang up] day. Cassie another beauty and of course the hardware can’t be beat. I’m a huge D.Lawless fan (as you know) and the hardware on this piece makes it sing. I’m betting it will be gone in a flash! Beautiful combination with the copper hardware! Love the warmth of the copper against the blue and cup pulls are just the best – really pretty Cassie! … And of course it’s snowing again! So pretty – the color and the new hardware! You have breathed new life into yet another piece! Sorry to hear about your wipe out and phone – your week can only get better after that! you turned that beast into a beauty! So what happened with the phone, did ya get a new one? So simple and classic! Two of my favorite combos. Gorgeous! Gotta love Duck Egg! I hope you all had a terrific weekend at the Barn. My neighbor was heading over there. You had great weather for it! The copper was 100% the right hardware for that!! It looks perfect with the top and the distressing you did. Incredible job! I am so sorry for the two big bangs!! Mud and a broken phone, and on a Monday! The dresser/buffet hopefully cancelled it out. It is gorgeous! I love the copper pulls, looks perfect. I can’t believe how big that thing is! 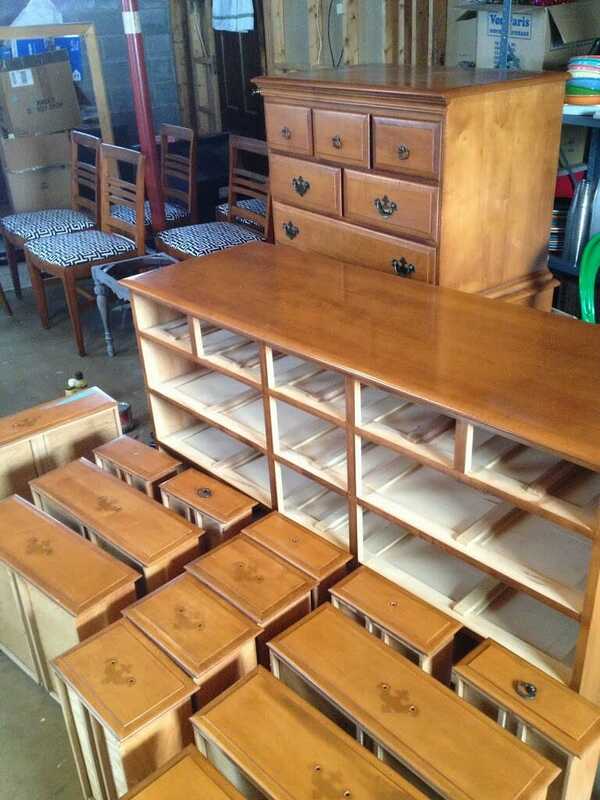 Will make the perfect buffet or high volume dresser for someone soon! Lovely! The copper is fabulous (I’m pretty sure I started that trend with Abe’s b-day party ;)). Those 70’s dressers are CRAZY heavy, aren’t they? The one in our sunroom is never leaving because I can’t imagine trying to move it again! It looks fantastic Cassie! 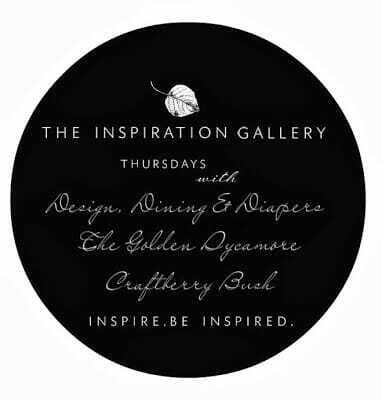 Just discovered your blog, following you from now on! The combination of the hardware and the color is perfect! 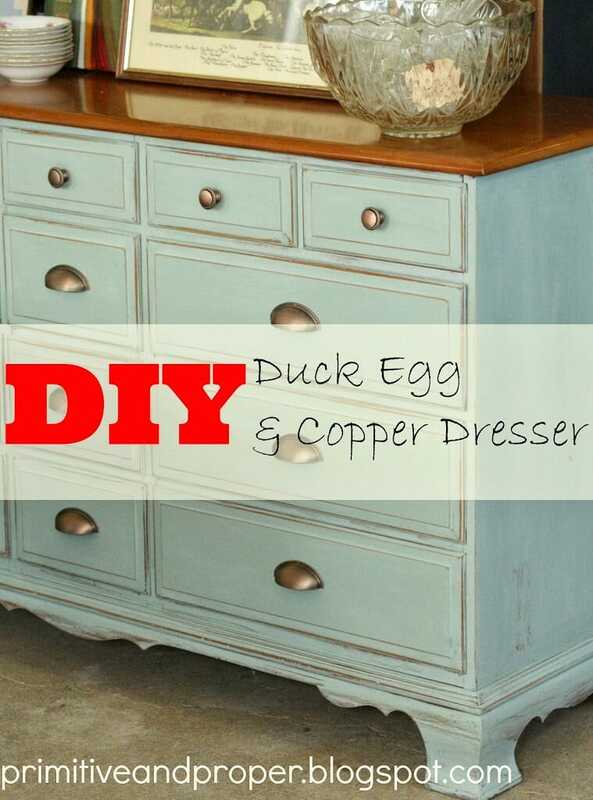 I LOVE the copper pulls with the duck egg blue, Cassie! This one is truly drab to fab! Thanks for doing another awesome job! I used the pictures as many places as I could! What a gorgeous piece! The color and the brass are just a beautiful combination! I wish it was warm enough for me to work on furniture in our garage. I’m itching to work on some things! It’s beautiful and the copper does go nicely with the duck egg! Good thing the pulls fit the existing holes because I’m counting 14 drawers! Ha! Did you think you’d ever finish? Look at all those drawers! I do believe Duck Egg is my very favorite ASCP color. Love it with the copper! This will sell at the next sale I bet. 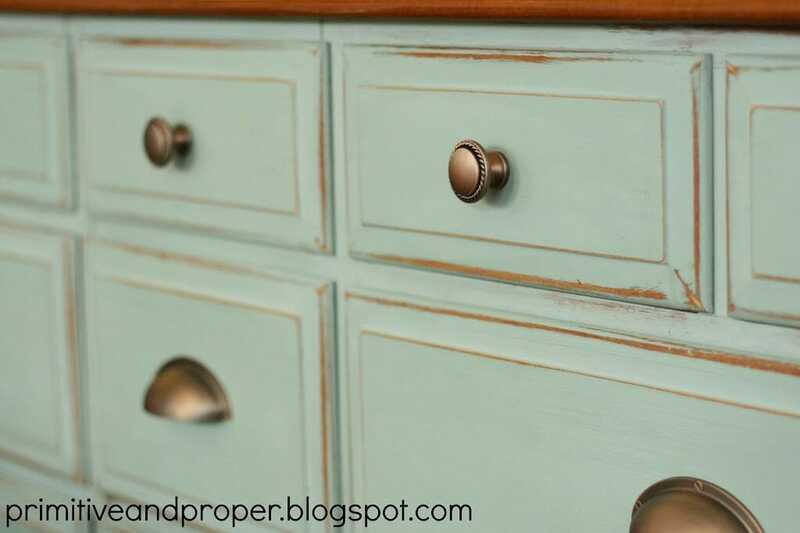 You really transformed this dresser Cassie! I love it. The duck egg is pretty with the copper pulls. Beautiful job!! Such a pretty shade of blue, especially with the wood top and hardware. As usual, well done, furniture whisperer! 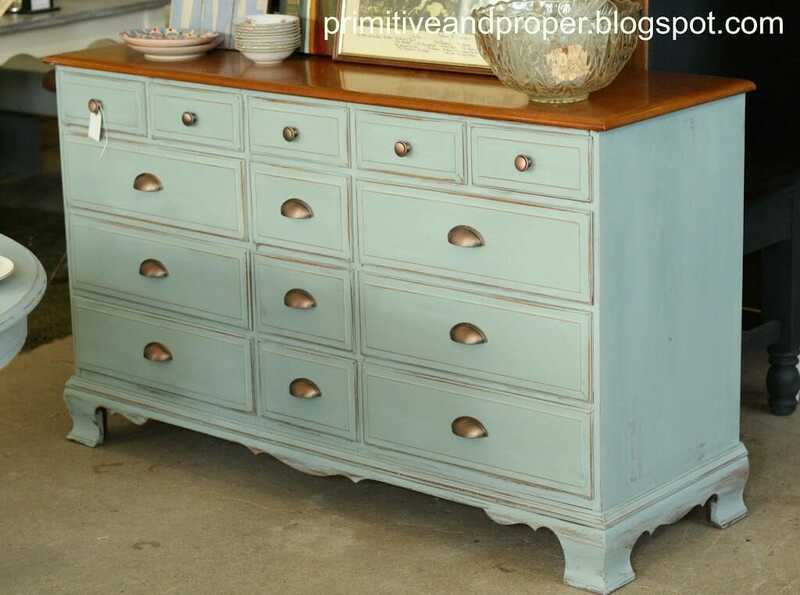 I seriously want this dresser to live with me in the barn. Road trip? that looks like a little match made in Heaven if you ask me. I think this makes one of my top five of your pieces. You should totally survey your followers and ask for the top 5. It would be interesting to see the results! Hello beautiful!!! The dresser turned out soooo darn pretty! It looks perfect at the barn!! You’re so talented Cassie! copper and duck egg looks pretty darn nice together! These two colors look so great together. I love copper and blue! And the bangs love awesome. Love the choppiness, very edgy! Keep warm and I LOVED Orphan Train, btw.. Amazing book. Duck egg is my favorite color right now! I love what you did with this, the copper looks stunning with it. The bin drawer pulls were a fantastic addition. Would never have thought about using those on a dresser, great idea! Copper is my favorite metal! This looks wonderful! I love the copper hardware! (Perfect pairing with the blue.) I’m sure it will be snatched up soon! Beautiful, Cassie! Love the copper with the blue. That is my favorite chalk paint color. Great transformation. Just bought my first can of Annie Sloan chalk paint this weekend – so excited! Could you tell me if you did anything to the top or just buffed/polished? Thanks!